As I may have mentioned before, I’m not a botanist. In order to identify a plant that has appeared in the garden, I usually have to allow it to bloom before I can even start to put a name to it. 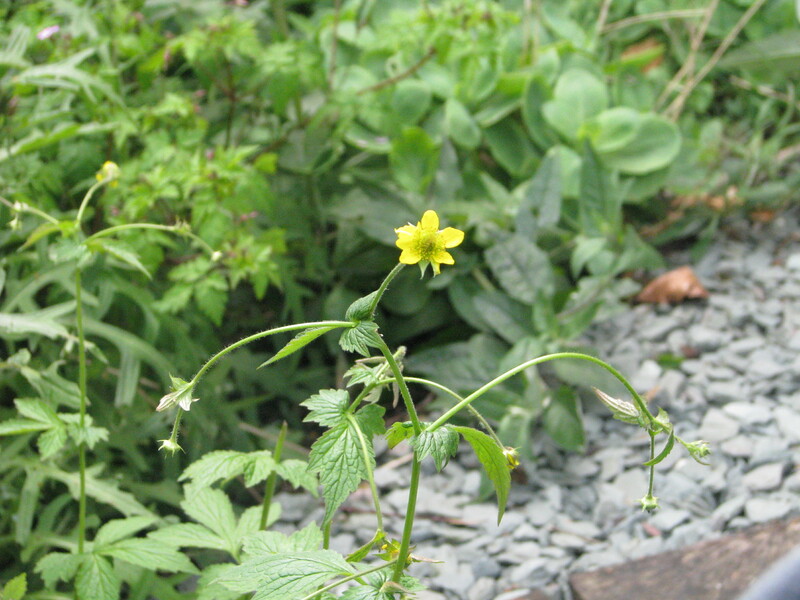 And so it was with this delicate, straggly yellow flower, which turned up for the first time this year. At first, I wondered if it was some kind of buttercup, or even a renegade yellow strawberry. 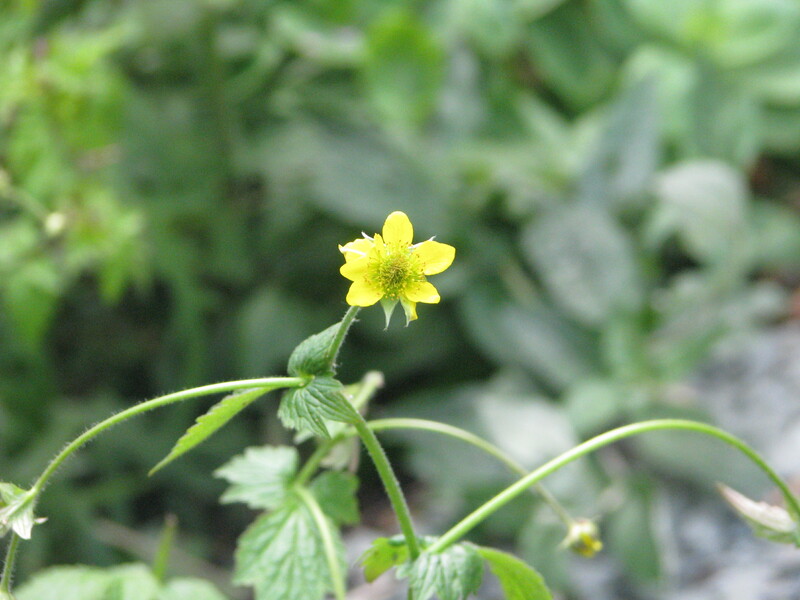 But eventually I worked out that it is a Herb Bennet, or Wood Avens, a member of the rose family and closely related to the cinquefoils and, yes, the strawberries. The name ‘Herb Bennet’ comes from the word Benedictus, so the whole plant is seen as a blessing. Hanging the plant up above your door was said to protect against evil spirits, and also against venomous snakes and rabid dogs. These virtues were absorbed into the early Christian tradition: the plant has three leaves, said to reflect the Holy Trinity, and, usually, five petals, reminiscent of the Five Wounds of Christ. I say usually because my plant appears to have six petals. The roots of the plant apparently have a clove-like smell, which has been used to flavour ale, and to deter clothes moths. The root, which had to be picked by 25th March in order to retain its vital qualities, has been used to treat everything from diarrhoea to fever to headache. The lovely foraging site Celtnet suggests using it as a pot herb, or as a clove substitute in apple pie. As you can see, the seedheads are covered in tiny hooks, and these can be transported from place to place on clothing, or in the fur of dogs, cats and rabbits. So, did my plant arrive attached to a wandering cat who had previously been in Coldfall Wood, and set up home because the conditions were right? I fear I will never know, but again I wonder if the land beneath my feet remembers that less than a hundred and fifty years ago, it was a wood too. Whatever the reason, I am very happy to be hosting this little plant, with its long tradition of culinary and medicinal blessings. This entry was posted in London Plants on May 14, 2014 by Bug Woman. What a charming little wildflower (weed) I could see her in a Beatrix Potter book! I enjoy your blog so much because it complements my own backyard observations. Just the other day I wondered what this plant with the small yellow flower that I had never seen before was. This very post identified it as Herb Bennet. I had in fact seen it’s seedheads on my cat’s coat before. Your post on Herb Robert rang a bell. A few days later I recognized it growing on some hardscrabble ground in a nearby yard. I carefully pulled up a plant for my own yard. And until I read your post on slugs, I never realized that slugs eat brown dry matter. But now I have observed slugs in my yard eat a dried bean pod over the coarse of several days. The fact that I live in Oregon, West Coast, USA makes our parallel observations even more amazing. Hi Lynn, glad you’re enjoying the blog! I love that there is such a community of backyard adventurers, noticing the plants and animals around them and sharing their observations…. This herb can become a nightmare. It infiltrated my garden several years ago and I am still trying to get rid of it. 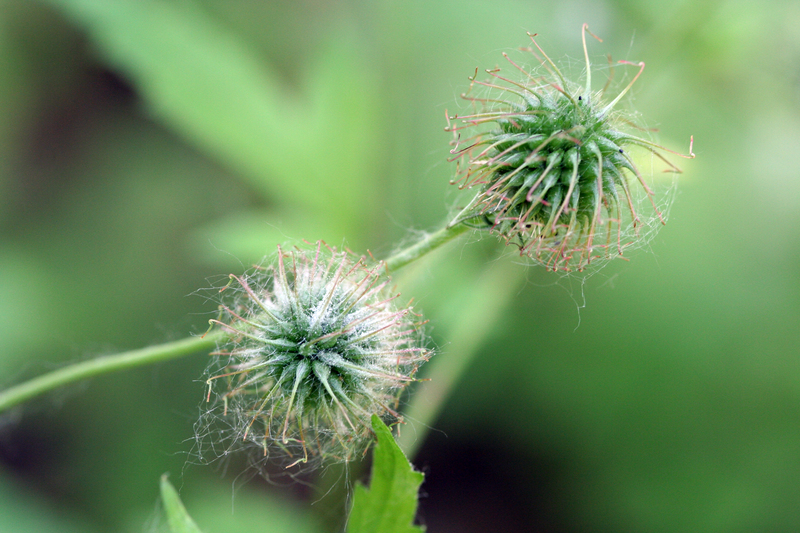 The seed heads explode when ripe, as I found when pulling up mature plants lurking in corners, and the plants can take over borders and lawns if not checked. Hi Teresa, it’s not a problem in my garden (yet!) but I do know that it can be very over-enthusiastic if it likes the conditions that it finds itself in. Good luck with persuading it to behave itself…. I have identified this today. I have lots in my garden, it seems very good at establishing itself all over. I’m glad to know it’s a flower of ancient woodland, it’s very welcome in my suburban patch. It’s just as well that you like it Sarah, as it can be very enthusiastic when it finds somewhere that it likes. I think it’s a charming little plant, and I especially like the little ‘hairdo’s’ that it produces at the end of the season…. This spring this plant has spread in my garden. And today the first buds burst, so I was able to identify it at last. Mine has, as well as yours, 6 instead of 5 petals. Incidentally, it prefers to grow next to my other (cultivated) Geum species. Herb Bennet is doing very well in my garden this year, Alf – I rather like the little hairy seedheads. And I love Geums too.